As I was traversing the flat world, which is LinkedIn, I came across Peter Troxler’s fascinating profile. There were many things that intrigued me and instigated my reaching out and inviting him to take part in the Innovation Interview Series. In particular, his research at the intersection of business administration, society and technology along with his expertise in applying the Internet and Web 2.0 technology to support the implementation of management systems. When it comes to hats, General Secretary at International FabLab Association, owner/director at p&s culture net and owner of the research company Square One are only three of the more than a dozen he currently wears. That said, it was Peter’s perspective as a serial enabler, which prompted my invitation… that and his moniker, the ‘Collaboriginal’, earned due to his determination to enable and empower collaboration and innovation. Peter, do you see a difference between ‘little i’ and ‘Capital I’ Innovation? I have not made such a distinction so far and cannot think of a real need to differentiate the two. However, I think there is a big difference between invention and innovation, and the terms are often confused — even in public dialogue and ‘innovation’ awards that pretend to award innovation, but often just give money to people who are inventors so they can start to sell their inventions. All of these need not be ‘globally’ new; innovation, in particular, can be completely local. What do you see as the main barriers to the success of innovation? The sit-and-wait-mentality of many inventors, who think that a good idea alone (or maybe with a prototype) will convince ‘entrepreneurs’ to take it and run with it. The idea that an ‘innovation’ has to be global. The belief that people ‘have to’ buy into an innovative product or service just because it is an ‘innovation’ (and has got an award that proves it). The belief that innovation is finished when its results are put into practice (or that there is a predictable way those results will take off and develop). How essential has innovation been in your career? Innovation has played a key role in many professional activities I’ve been involved in — be it in the arts, academic research or business. In many ways I’ve been involved in making innovation happen. I’m not a serial entrepreneur; but I’d like to see myself as a serial innovation enabler. My passion is, together with others, to put new ideas into practice and to grow them beyond singular prototypes. When the innovation makes the transition to routine, I lose interest. You’re one of the three founders of p&s culture net, can you tell me a bit about why you started it? In the late nineties I started p&s culture net together with two friends in Switzerland. We set out to investigate what the impact of the internet would be on literature. It began with workshops and small events, and grew into quite a substantial business, doing quite large public events in Switzerland. We work around literature and try to make literature accessible in new ways. And who, typically, would be involved in your workshops? We try to get a good mix of people including researchers, academics, philosophers, historians, artists and even engineers. We use the workshops as a kind of ‘think tank’. For instance, when we were investigating what the internet does to literature, literary production, and literary consumption, it was extremely helpful to have all these different types peoples around the table. I’m sure. And did your investigation come up with an answer as to what effect the internet has on literature? No, not really. When I think back on that particular series… it [the internet] just creates so many new ways to work with text. And that text, and writing, are still very important and very relevant skills. 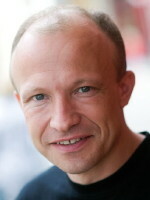 You are also the General Secretary of the International FabLab Association, which you’ve been involved with since 2007. What is FabLab? FabLab stands for Fabrication Laboratory. It’s a concept that was developed at MIT by a physics professor, Neil Gershenfeld, about ten years ago while he was investigating how to create self-replicating matter. Neil uses all sorts of machinery to do his experiments; and created the ‘How to Make Almost Anything’ course, which has been over-subscribed ever since it started. People learn to use digital machinery like laser cutters, milling machines and 3D printers. There’s a standard set of, relatively, simple machines that make up a FabLab. The set-up is relatively easy to use, so, about ten years ago Neil started to set up FabLabs in third-world countries, and in deprived areas in cities such as Boston, to give people instruments to play with and make their own stuff. 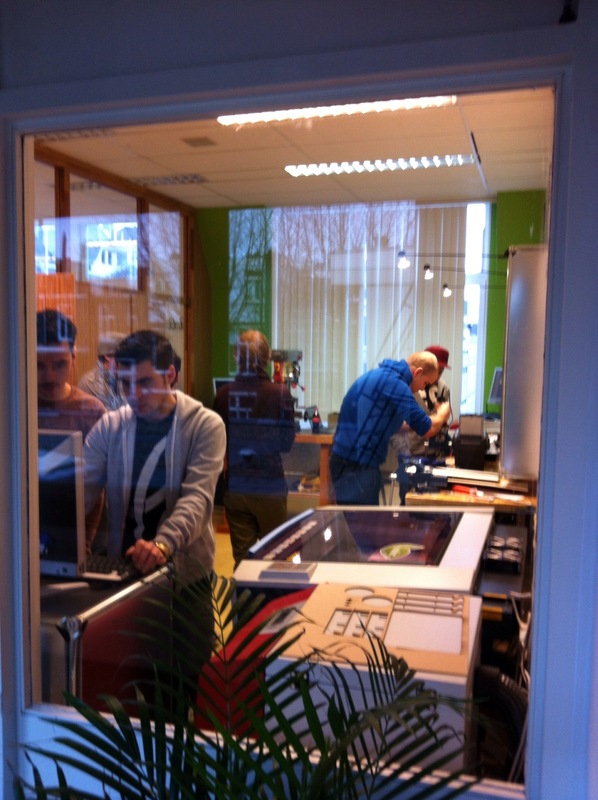 The idea took off, and suddenly everybody wanted to have a FabLab. Currently there are over 70 FabLabs in the world… on almost every continent. I think Australia and New Zealand are just waking up to the idea, but there are FabLabs all over Europe, in Africa, South America, Russia and a few in Japan. How are FabLabs being used developing nations in particular? They are used to make everyday stuff. There is a beautiful project in Africa… They buy lamps from China, which would run on batteries and have conventional light bulbs in them. The lamps are disassembled in the FabLab, the conventional light bulbs are replaced with LEDs, the batteries are replaced and LED cells are added. Now the lamps can be charged by sunlight and are sold on. This sounds like the implementation of innovation. You have spoken in the past about businesses exploring and using open source and open innovation. How have found businesses reacting to the idea? However, if you look at it more closely, the first thing you notice is that protecting your IP is extremely expensive and time consuming, and it distracts you from the real purpose of business, which is making money… there is so much time and money spent waiting for bureaucrats to file applications. The other thing you notice is that there’s this axiom ‘IP protection helps innovation;’ so people think, “If there is no IP protection, there will be no innovation.” There’s absolutely no proof of that. There is no empirical evidence that IP protection helps to grow businesses, except probably in two sectors… one is a no brainer, the lawyers. And the other, though I haven’t looked at it very closely, is the pharmaceutical sector. If you get counterfeit medicine, which doesn’t do what it says on the tin, that’s an obvious problem. Are you attempting to convince business that they should be exploring the ‘Open’ option? I am indeed. I’m working with various people, from the industrial design corner of the world, to really look into the issue and find ways for designers to make a living in an open source context. Square One seems to sit in a very interesting niche, at the intersection of business, administration, society and technology. How would you use technologies such as Web 2.0 and 3.0 to support the implementation of management systems. The intersection of business, administration, society and technology in the whole context of open source, open innovation… it’s huge! It’s massive! What I’m trying to do is break it down and apply it in very specific contexts. Currently the main context I am working in is the FabLab context, because they refined everything. FabLab is the thing that is socially relevant. They are open to the general public and are, obviously, technology based. But, I would say, half of the FabLabs existing right now are struggling to find sustainable business models. They’re being set up with subsidies of some kind, which helps them run for a couple of years. Since we have such a massive growth in the number of labs – the number is doubling every 12 to 18 months – there is no real experience of the post-subsidy period. Because many of the people who set-up FabLabs are enthusiastic tech people, they don’t have the kind of business understanding that would enable them to set up such an animal to survive long term. That’s the specific area of complication where I try to bring all those aspects together. Where do you think the FabLabs movement will be in ten years? That’s a very interesting question. Because ten years is quite a long period, if we look at the technology we’re dealing with. It could be that by the time certain machines are cheaply available the raw material won’t be. It’s kind of hard to predict. DIY stores, for instance. You’d buy material, then go next door to the FabLab and build something. It makes complete sense. The classic clash between corporate and communal. Do you have an opinion as to which is a better t? I would have to imagine a world where both exist side by side. Not everybody would go to a community-run FabLab and wish to have this type of community. But, it makes so much sense to produce a lot of stuff yourself. Maybe I am oversimplifying, but it seems to me that you can go and brew your own beer… many people do. Personally I prefer to go to the store and buy it, but that’s me. I think there’s room for all of us who like beer to do whatever is most comfortable. Here’s hoping that FabLabs become as ubiquitous as beer! Speaking of which – and yes, I’m segueing from beer to thoughts of Holland – there is a FabLab opening today in Rotterdam, isn’t there. Yes, and its happened really quickly [though not as quickly as Fablab Amersfoort, which was set up in 7 days – here’s how]. They got the financing to do it in May and the first iteration opened in September. Today it opens for real. To move this fast, we had to bring all sorts of concepts together: open source, the unconference, the possibilities and mentality of the internet – where sharing suddenly is much more easily achievable – and rapid prototyping. It’s a completely different approach to the more conventional control mentality approach. It’s an entirely new ecosystem… it’s research AND development – rather than the more common research THEN development. Well harkening back to my beer analogy… Cheers to that!